Cesc Fabregas and Victor Moses. Moses, the only Chelsea player, was nominated alongside four other African footballers. Cesc Fabregas has solicited for votes for his Chelsea teammate Victor Moses to win the 2017 BBC African Footballer of the Year. 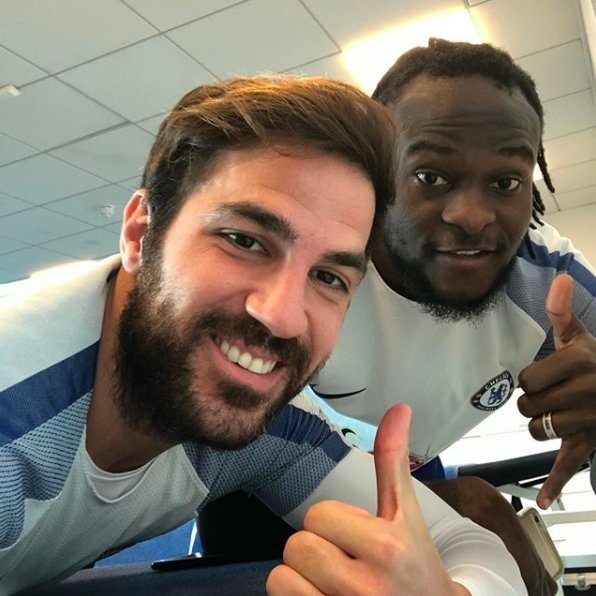 “Vote for my friend Victor Moses who’s been nominated for the BBC African Footballer Of The Year,” Fabregas wrote on Twitter on Monday. Other shortlisted players are Mohamed Salah (Egypt/Liverpool), Sadio Mane (Senegal/Liverpool), Naby Keita (Guinea/RB Leipzig) and Pierre-Emerick Aubameyang (Gabon/Dortmund). Moses who is recuperating from injury, is also included in a 30-man shortlist for the 2017 CAF African Footballer of the Year Award.